Oh I love this project – it’s very easy and I’m enjoying making the layouts and personalising elements by adding some words, scribbles and good old washi tape. I used the washi tape in the bottom left to make little hinges. If you lift the photos up, there’s some journalling underneath. We were sick over the weekend so it was very uneventful but we still had fun playing with balls, food and an impromptu photoshoot. 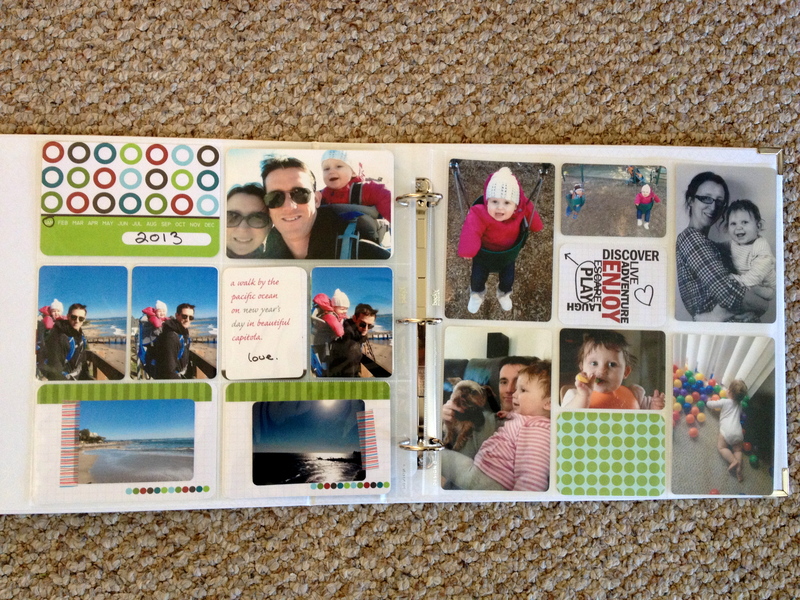 I need to do some more work on Emily’s baby album and I’ll share spreads from that soon too. Happy New Year everyone. Did you have a wonderful Christmas? Emily’s first Christmas was a very special day, I don’t think I’ve loved Christmas so much since being a child myself. I want to bottle all the memories so I can look back on them in 20 or 30 years time and smile. Which brings me on to my new project for 2013 and an important word. Have you ever chosen a word for the year ahead? One little word to represent how you want to live in the next 365 days. I’ve done it a few times since hearing about it on various blogs. It sounds like a slightly boring word conjuring up corporate meetings: Let’s take another look at your document about blah blah blah blah blah; Can you send me a document about that new widget we want to implement? ; Can you document your process? But it’s got so much more meaning to me now. I want to document our life, Emily’s first year, our adventures, our every day, our normal and our extraordinary. This means living a life worth documenting. Going on adventures in our city, our state, our country, our backyard, our kitchen and in stories, pictures and imaginations. It’s so easy to get bogged down in the mundane (which is also worth documenting in itself) but one of my resolutions for the year ahead is to have more fun. At the end of 2013 I hope to have a big jar of memories to look back on. My chosen method of documentation is Project Life. I’ve always been intimidated by scrapbooking: those big blank pieces of 12×12 paper staring at me and having no clue what to do with them. But these albums look like so much fun to collate. And fast! Plus there’s room to be as creative as I like or keep it super simple. I’ve already started a retrospective album for Emily’s first year which I’m enjoying immensely. But I’m also starting a family album for the year ahead. 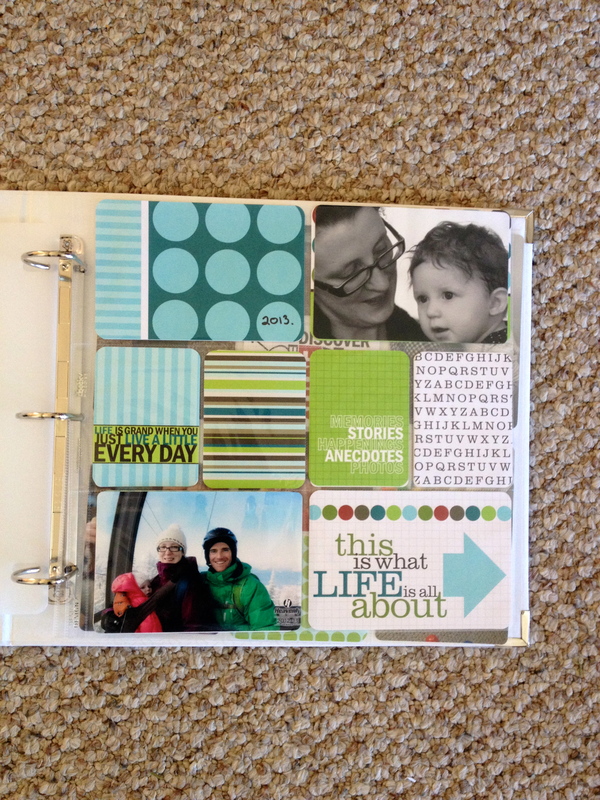 To keep me on track I commit to sharing weekly layouts here on 52 crafts – and hopefully other creative bits in between – so I hope you’ll follow along, share ideas and links to yours or others albums, and enjoy the project. Have you chosen a word, project or some resolutions for the year ahead? I’d love to hear them.